Search for primary care practices based on information that matters most to you. Primary Care Practices are rated on how well they work with their patients to provide them with quality care. 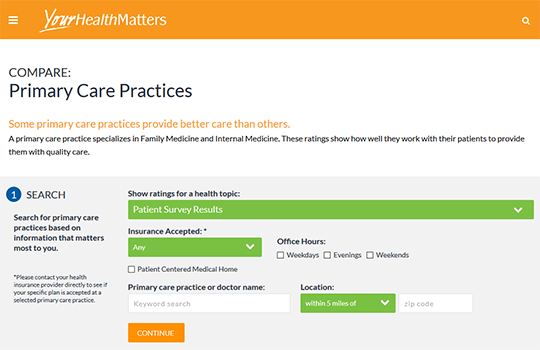 YourHealthMatters reports ratings based on both clinical data and patient survey results. Clinical data on medical treatment and testing in the areas of diabetes, cardiovascular disease and colon cancer screening. Patient surveys are standardized and validated questionnaires asking about a patient’s experience after going to their doctor’s office. Compare quality ratings of primary care practices in Greater Cincinnati, to see how well they provide diabetes care, cardiovascular care and colon cancer screenings.